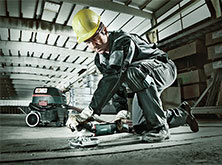 The first large cordless angle grinder with 230 mm disc - with a cutting depth of up to 77 mm. The new KGSV 72 Xact SYM mitre saw is a mobile all-rounder for floorers: It is the world's only saw to combine the classic functions of a mitre saw with a symmetrically adjustable stop system. Thanks to this patent-pending combination, users can accurately cut panels and also skirtings. Perfection in the construction trade. 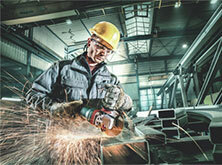 The new rotary hammers in the 2 kg class: extremely robust for hard continuous use. Now we are starting a technological revolution with the innovative Metabo LiHD battery packs: Not only could the run time be increased by up to 87%, but with up to 67% more power. With Metabo you enjoy all benefits of an experienced system provider when it comes to compressed air technology.